Custom, single story home on just under an acre lot. This ranch style property was built in 2006 and features 4 large bedrooms, 3.5 baths with over 3,000 sq. ft of spacious living area. This property is fully upgraded throughout, it has a large kitchen with granite counter tops, large center island, breakfast bar, stainless steel appliances, plenty of cabinet space for storage, tile flooring and ceiling fans throughout. Includes formal living room, dining room, indoor laundry, office/den, separate family room with fireplace. Huge master suite with retreat, dual sided fireplace and walk in closet. Master bath has granite throughout, his and hers sinks, oversized tub and frameless, glass walk in shower. Backyard offers a large patio cover, flat usable land with endless possibilities, shed, and separate structure that can be used as a bedroom or extra storage, with its own entrance, matured fruit trees and palm trees. Very private, quiet location with endless views of the mountains. This home has it all...a must see, don't miss out!! 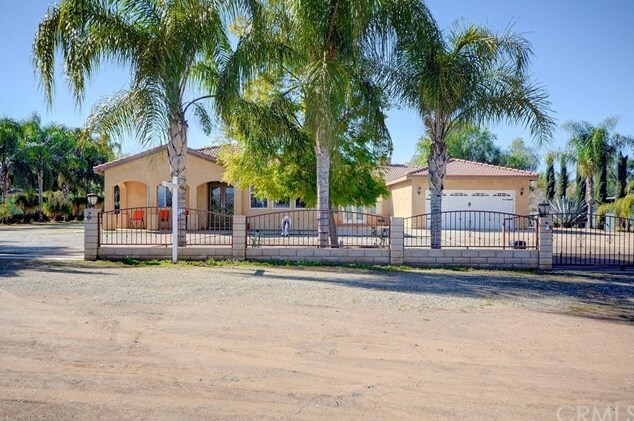 26351 Wheat Street, Menifee, CA 92586 (MLS# EV19034307) is a Single Family property that was sold at $535,900 on April 23, 2019. Want to learn more about 26351 Wheat Street? Do you have questions about finding other Single Family real estate for sale in Menifee? You can browse all Menifee real estate or contact a Coldwell Banker agent to request more information.